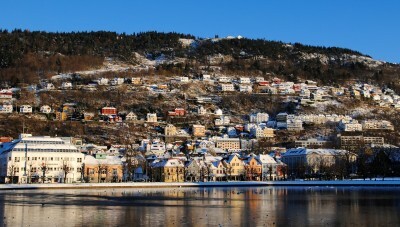 Norway’s West Coast city of Bergen has preserved its history but also is best equipped to tackle the future, according to a survey of the country’s 71 largest cities. Bergen tops the list, followed by Bryne farther south in Rogaland, and Kongsberg, which has been attracting new businesses for years. The survey, conducted by consulting firm Multiconsult, analyzed all of Norway’s cities with a population of more than 10,000. The goal was to rank them in accordance with how well-prepared they are to tackle a future without enormous income from the oil and gas business, with more elderly residents, and facing major challenges because of climate change. The survey measured, among other things, the various cities’ numbers of patents issued per resident and newly established companies, how many private business enterprises are based in the city and local residents’ levels of education and general competence. Bernt Sverre Mehammer, a marketing chief at Multiconsult, said the index compiled “shows very clearly that the oil industry have been extremely important for Norwegian businesses.” It has spurred innovation that now needs to be transferred to other ventures as Norway strives to diversify its economy and make it less dependent on oil and gas. According to Multiconsult’s list, the top 10 cities ranked as most future-oriented are Bergen, Bryne in Rogaland County, Kongsberg, Oslo, Sandnes, Bærum, Sola, Stavanger, Trondheim and Ålesund. Fully four of the cities (Bryne, Sandnes, Sola and Stavanger) are all located in Rogaland County, long seen as the cradle of Norway’s oil and gas business and an area that had to restructure itself quickly when the oil industry was first launched in the late 1960s. When oil prices collapsed four years ago, many communities were forced to create alternatives to oil income. That has helped boost an entrepreneurial culture that’s spawned news ventures such as Zoaring in Stavanger, which specializes in creating short films that businesses can use to clarify everything from internal restructuring to company values. NRK reported that since its launch in 2012, Zoaring has grown to now encompass 10 employees generating around NOK 10 million a year. Ragnar Tveterås, a professor at the University of Stavanger who specializes in cities’ business development, called Multiconsult’s survey “a fun starting point to stimulate discussion.” He was uncertain, however, over whether its analysis is correct.